We refer to integrations between CaptionSync and your video platform as “workflow integrations” because they vastly simplify the workflow of adding closed captions to online videos. Rather than uploading video files to CaptionSync, downloading the caption files that we generate, and then uploading those caption files to your video platform (“the manual method”), our integrations automate this entire process. The best news of all: these integrations are included at no extra charge when you transcribe and caption your videos with CaptionSync – no setup fees, no per file fees, no hidden costs. The captioning request is typically made from your video platform. Simply indicate which videos you want captioned, and we’ll do the rest. CaptionSync retrieves the videos, routes them to the appropriate transcribers, and generates the appropriate caption files. The caption file is automatically pushed back to your platform/video accounts. Professional transcribers provide 99%+ accuracy not found in speech recognition or crowd-sourcing solutions. Simple web-based submission process — no special software required. Quick turnaround: 3 business day, 1 business day, or 8 hour turnaround. 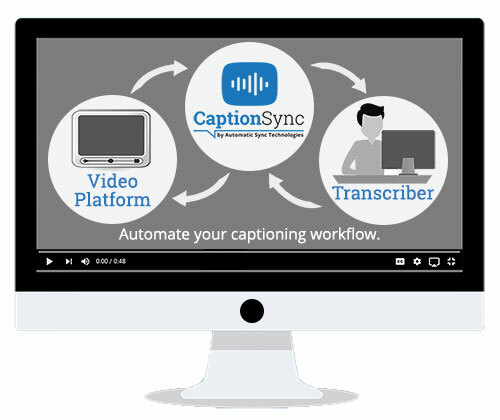 No need to download or upload caption files; CaptionSync adds captions to your platform/video accounts automatically. If you already have a CaptionSync account, you can integrate your video platform with CaptionSync with the same account. Our Support Center explains how to do this.